I recently returned from a vacation to the Red River Gorge area of Kentucky. We decided to make a little detour to the town of Berea on our way home. Berea has a lively artisan community, due in great part to the presence of Berea College where admitted students (primarily low income student from Appalachia) can attend tuition free by working 10-15 hours a week in the Student Crafts program. They are producing traditional Appalachian style crafts in ceramics, woodworking, jewelry making, broom making, basket making and of course, weaving, which is the heart of their Student Crafts program. 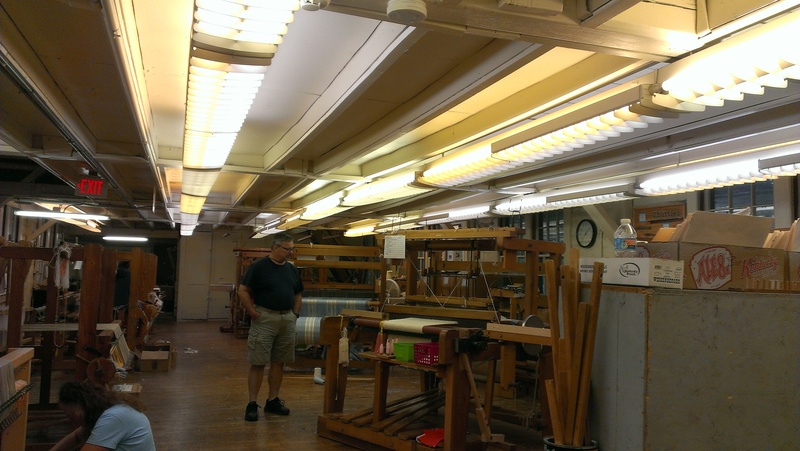 I visited the weaving studio and talked for over an hour with Amy Judd, the Weaving Supervisor. She graciously showed me around and we talked about looms and weaving for over an hour. Amy shared with me some of the unique problems of running a large production studio that the usual home weaver doesn’t have. (Trying to get enough yarn of the same dye lot to warp 100 yards for a blanket warp!) I got some tips on warping my sectional beams on my looms from one cone of yarn rather than multiple packages by using a tension box with a chained warp that is two or three times the length of my needed warp. She fired up the AVL loom to show me the student designed draft they were working on for bread cloths with 10/2 cotton which will be a new item in their line of products. They weave two items side by side with cutting lines and sewing lines so they can have fringe on all 4 sides. She also sat down at the loom with the fly shuttle, automatic advance and a sandpaper beam and roller system to show me how it worked. 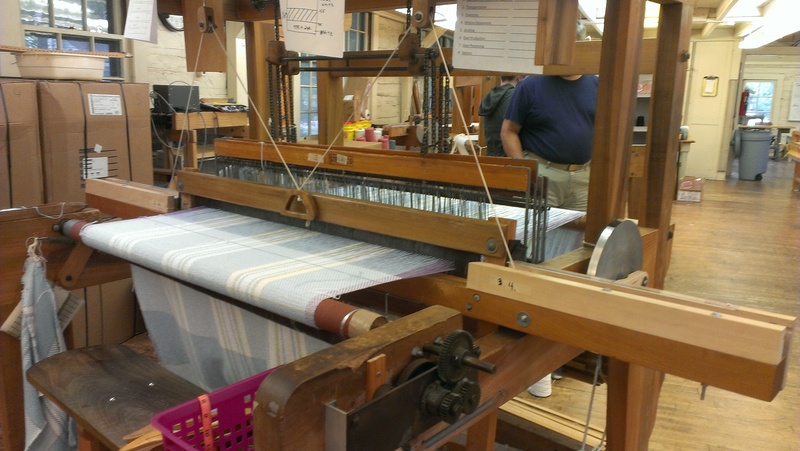 This set up allows them to put on very long warps for production weaving. 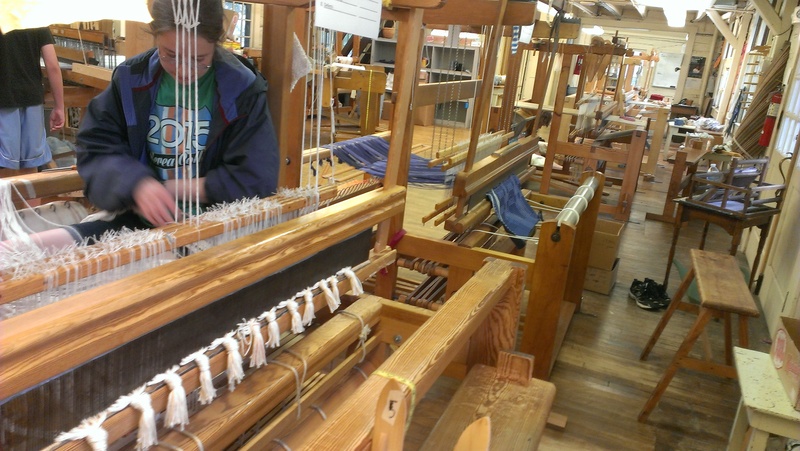 They do not wind the finished cloth onto a beam, but let it hang down until it is finished. Space is left for fringe and the weaver begins the next blanket. The blankets can be cut off as they are woven without having to retie the warp to a cloth beam, it is just held under tension between the beam and roller in front and never has to be retied. This is a great time-saver. You can see the woven cloth hanging loosely in this picture on the left. It takes a path between the sandpaper beam and a lower roller and keeps the tension on the warp that way. 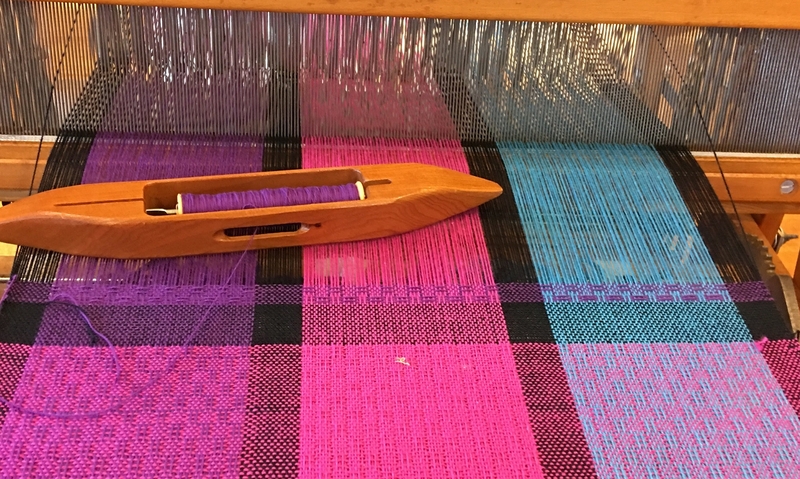 The studio has certain looms set up for certain projects and always tie the new warp onto the old one so that they don’t have to re-thread the heddles each time and introduce threading errors in the new warp. 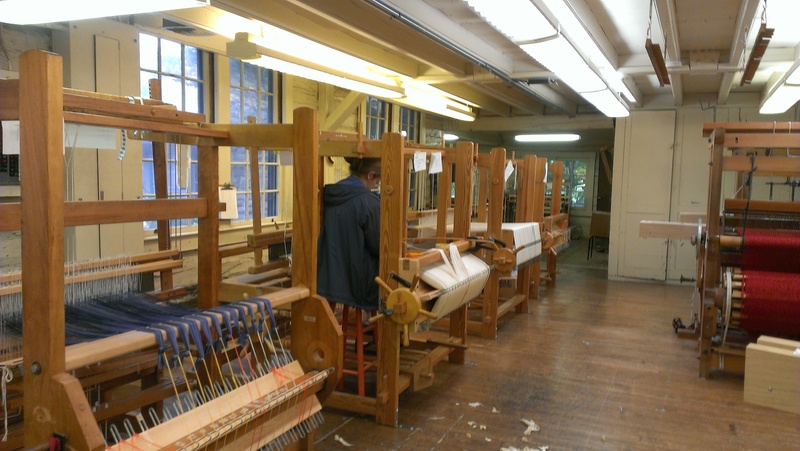 In this photo on the right, one of the student workers is tying on a new placemat warp. If you are interested in buying their products, you don’t have to go to Berea (although I highly recommend a visit there). You can purchase their handcrafted items online. Today I depart from fiber arts and venture into the culinary arts. I am making curried lentil and sweet potato soup, homemade pitas and goetta. The picture is from the last time I made it. I served it with fresh hot rolls that day. The soup is a great recipe that has been adapted from the Cafe Brenda Cookbook by the authors of Artisan Pizza and Flatbread in 5 Minutes a Day. I also made my own little changes to it. The recipe as I make it will follow at the end of this post. Today I made a cilantro chutney as a garnish. Other times, as pictured above, I serve it with fresh chopped cilantro, a squeeze of lime for a citrus tang and sometimes a dollop of low fat plain yogurt. The pitas are made using the methods in the Artisan Pizza book too. Yummy stuff. When I make goetta, I use the recipe on the bag of Dorsel’s Pinhead Oatmeal with some adaptations. Pinhead oatmeal is steel cut oats. Dorsel’s is usually with the flours and cormeals in my grocery and is usually cheaper than the steel cut oats you find in the hot cereal section. Some cereal companies have come out with “quick” steel cuts oats lately, do not use those. My family loves spicy goetta for breakfast on the weekend. Goetta omelets are a particular favorite. Add onion, garlic and ginger to a large pot with a bit of oil. Saute until softened. Add peppers, carrots, and curry powder. Saute about 5-10 minutes Add the sweet potato (add sweet potatoes after stock and a little simmering if already baked), stock and coconut milk. (If you couldn’t find red lentils add regular ones now too-they take longer to cook). Simmer covered about 30 minutes until potatoes (and lentils if green) are cooked. Use a stick blender to make soup a little smoother or you can leave it pretty chunky. I add red lentils after blending since they cook quicker and are softer. Add lime juice, sprinkle with chopped cilantro and a dollop of yogurt if desired just before serving or serve with the chutney below. 1 large jalapeno diced (seeds and all if you want it hot). Directions: Heat the oil in a small frying pan and saute the jalapeno and ginger for about 2 minutes. Reduce the heat and add garlic paste. Remove from the heat and add coriander leaves and mix completely. Heat a little to wilt the cilantro. Place the mixture together with, salt and sugar in a food processor or grinder and mix until well blended. I also usually throw in some onion powder and dried Italian seasoning. 1. Put water into crock-pot on high, heat on 20 minutes, add salt, pepper, pepper flakes, and oatmeal. 2. Cook 90 minutes on high, stir once or twice. 3. Add meat, olive oil, onion, and bay leaves, mix well to blend meats after they warm a little. Turn to low heat. 4. Let cook 3 hours, stirring occasionally after first hour. 6. When ready to use, slice the loaf of goetta and put into a pan in which there is a little olive oil, brown slices until crispy or break apart and cook until crispy. I have been a busy bee lately and didn’t realize it had been so long since I had posted. I have taught 6 classes since the last post. I have pics from a couple of them, but forget during the class to snap a couple of shots. I have another class tomorrow, and will try to remember to take some and to post after. 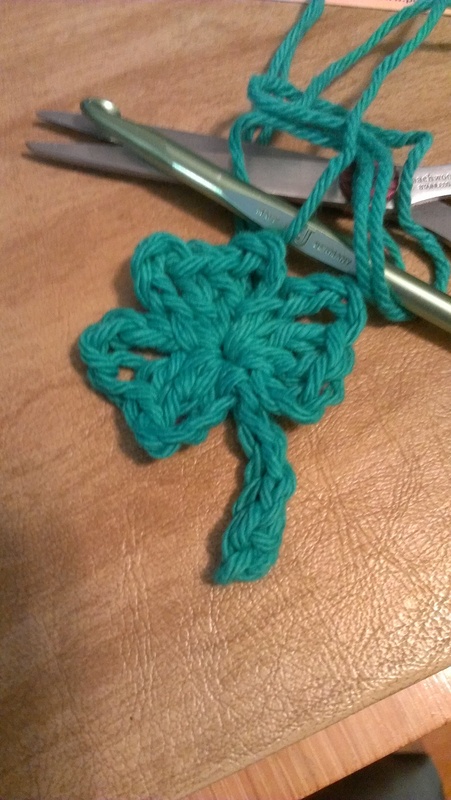 Meanwhile, the crochet bug bit me last night, so a happy St. Patrick’s Day to everyone!